Mike Zimmer made it official today: Even though Teddy Bridgewater is finally back, healthy, and ready, Case Keenum will start at quarterback for the Vikings in Sunday’s showdown against the Rams. Then again, Zimmer really had no choice. Sure, Bridgewater likely still represents the future of the franchise, but the Vikings have won five in a row, and Keenum has actually been okay since taking over for the injured Sam Bradford in Week 2. The job should be Keenum’s, at least until he plays his way out of it. Which is still very possible! Beyond that, Keenum has been pretty efficient, even with running back Dalvin Cook having been out since Week 4 with a torn ACL. Keenum ranks second in the NFL in DVOA (value per play), third in Total QBR (72.6), fourth in DYAR (total value), and eighth in adjusted net yards per attempt (6.99). He’s also completed 64.9 percent of his passes, which ranks 11th among qualified starters. That’s all pretty good. But digging deeper, it becomes clear that Keenum has had lots of help, which ought to be no surprise for a guy who entered the year having thrown 20 interceptions against 24 touchdowns across 24 career starts in four seasons. Keenum turned the ball over 13 times last season as a member of the Rams, though the Jeff Fisher Factor was also in play. Keenum’s resumé screams serviceable backup, and he’s done little to dispel that notion this season, even with the Vikings sitting at 7-2. To wit: Per Pro Football Focus, Keenum’s performance across the board has ranked squarely in the middle of the pack among starting QBs. See? How is Keenum doing it? For one thing, the Vikings made significant upgrades this offseason to an offensive line that had been completely overwhelmed by injuries last season. 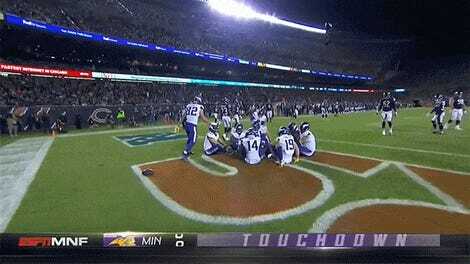 Per Football Outsiders’ adjusted games lost statistic, the Vikings’ O-line lost a total of 57.2 games to injury in 2016, the highest number for any team this century. So Minnesota went out and added three starters: left tackle Riley Reiff and right tackle Mike Remmers via free agency, and center Pat Elflein* in the third round of the draft. As Robert Mays noted over at The Ringer, this year’s O-line has mostly avoided injuries, though Remmers missed last Sunday’s win at Washington with a concussion. And the Vikings rank second in adjusted sack rate (2.9 percent), according to Football Outsiders. Then there is the play of wideout Adam Thielen, a 2013 undrafted free agent who spent his rookie season on the practice squad but who has come into his own this year as one of the league’s best slot receivers. Thielen now ranks third in the league in receiving yards (793) and is tied for seventh in receptions (56). He also accounts for 28.9 percent of the Vikings’ targeted throws this season. According to PFF, Thielen ranks third in the league in yards per route run (2.53) and second in yards per route run out of the slot (2.24). But Thielen isn’t doing it by himself. 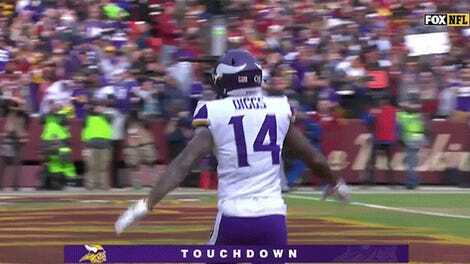 Fellow wideout Stefon Diggs, despite missing two games, has 500 receiving yards and a team-high five TD receptions in addition to averaging 16.2 yards per catch. He also averages 2.26 yards per route run, according to PFF, which ranks seventh in the league. Per PFF, Diggs has caught 69.2 percent of the contested passes thrown his way—the best figure in the league. And Thielen (61.9 percent) ranks sixth. That’s a lot of bad throws translating into catches for Minnesota. And tight end Kyle Rudolph has caught at least five passes in five straight games, while running back Jerick McKinnon—who’s splitting the backfield load with Latavius Murray in Cook’s absence—has 30 catches. Offensive coordinator Pat Shurmur has done his part to help Keenum by relying heavily on play-action. Per PFF, Keenum has used play-action on 28.1 percent of his dropbacks this season; only Deshaun Watson, before his injury, used more. 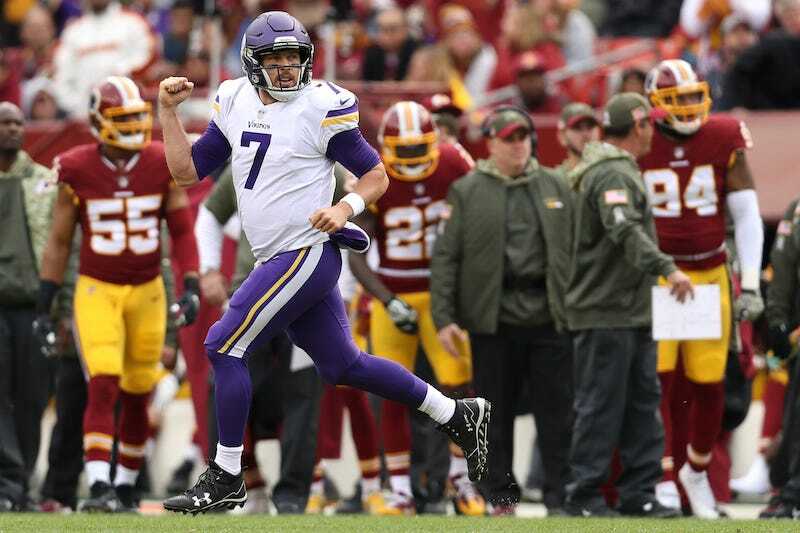 Also per PFF, Keenum is 53-for-73 for 792 yards, four touchdowns, and zero interceptions on play-action throws. His 126.1 passer rating on play-action passes ranks fifth among quarterbacks with at least 14 play-action dropbacks. And Keenum has completed passes at 10.7 percent higher rate when using play-action versus non-play-action, the fourth-highest difference in the league in completion percentage. Keenum has beaten some pretty good defenses, too. Football Outsiders ranks the average defensive DVOA of the Vikings’ first nine opponents as the second-hardest in the league, though two of the best defenses they faced involved a game started by Sam Bradford (Saints) and a loss that was far and away Keenum’s worst game of the season (Steelers). The Vikings know what they have in Keenum, and it’s been good enough—so far. Bridgewater hasn’t played in nearly two calendar years, so they don’t quite now what they have in him—at least right now. Teddy Bridgewater may indeed be the Vikings’ future, but the ultimate arrival of that future still depends on Case Keenum. * An earlier version of this post incorrectly referred to Pat Elflein’s first name as Paul.